That's... annoying, but of course an offer better than expected is always worth consideration. In terms of "values above" the odds come down to about the same, but it reaaally wouldn't take much for things to start crumbling. I'm fairly tempted, but surely this is where my luck turns around, surely? NO DEAL, and Boxes 5, 4, and 22 for the ABR. £200,000!! ARR AND THE 1-IN-165 DISASTER ROUND!! YOU CAN STILL WIN MONEY IN THIS GAME!! Hypo £1,000, but I'm not predicting after a jump like that. More generous than Ben even anticipated - a bailout, perhaps? Take it if you wish, or not if you wish not to - Deal or No Deal? It's definitely a bailout, but I reckon if I set my sights on a red win I'm better off saying NO DEAL. Boxes 17, 6, 8 next, looking forward to a £300 peak after this round! .........should you keep the £20,000, which certainly isn't a given. Box 17 - £200! Not getting it! £10 AND WHOOMP THERE IT IS! Yeah, that's about the range I'm thinking as well. He can't exactly go down and much less would feel forcing when I've got a 40% chance of taking him for over twenty grand! You could guarantee a red win here with that. Or you could put £6,500 in the menu. Deal or No Deal? DEAL £1,250 + NO 23, I'm not risking 75% of the average on the 40% disaster chance of playing on and I'm also not risking 75% of the average on the 50% disaster chance of taking 23. Oh right, Boxes 18 and 21 to leave all the 1s to the end, then Option 4 for hypo-23. £500! 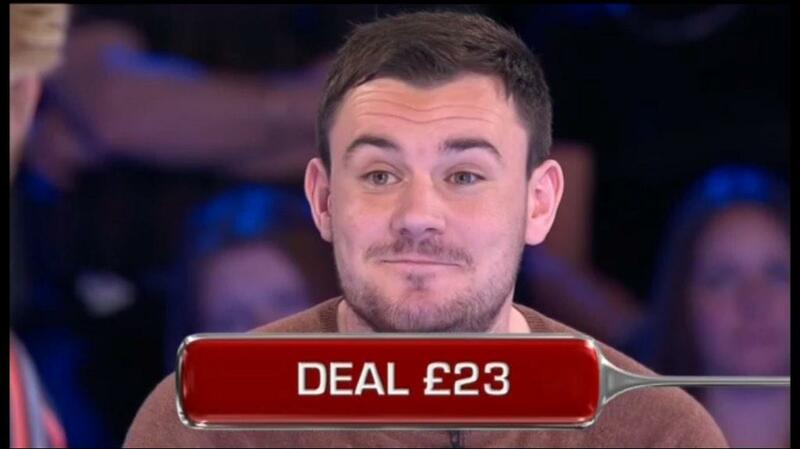 The landmine was there to be hit in 1 with £20,000! Oh. But it's still the third biggest win in Double/Trouble history!